Mullet roe and Sardinia have been indissolubly linked for about 3000 years of history. The Sardinian caviar is retained in the viscera of a fish, the mullet. The knowledge of the eXtraction, the salting and the drying of its eggs is an ancient tradition that goes back to the “Nuraghe” inhabitants, a typical building of the Sardinian lagoons. The mullet roe, thanks to its taste and its difficult availability, became soon a very refined product, which was considered of noble origin and precious. Infact it is used as gift for special occasions. Nowadays mullet roe is known all over the world and there are a lot of people who love this kind of food. For this reason mullet roe has incited a thriving market and thanks to the continous seeking of food lovers it is exported all over the world. Recently they asked for the Protected Designation Origin (PDO), because they tried to duplicate it and this is a damage to this unique product. 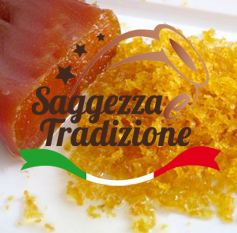 The best place in which mullet roe can be produced is undoubtedly Sardinia. The special ambient of the Sardinian swamps and ponds together with the salty water is the best place in which mullets can grow up, spawn and breed.